My daughter will turn 21 in October of her junior year at UCF as do many students during their junior year. How fun! This birthday is often coined as pretty significant, but mostly, for college students, because they can now legally get into places that they could not get into before. Some schools have traditions that students participate in (and we don’t get the opportunity to say no anymore, but we can still throw in a few “be careful and make good choices” beforehand). On “Sign Night,” a bucket list of things to do is created by the friends of the birthday person. People use a marker to sign their signature to one’s body for each shot done together. Often a bottle of champagne is popped open for the crowd from atop the bar. These are amongst the night’s activities. It sounds to me like a themed bar crawl in honor of the student turning 21. It is similar to what FSU girls call a Waltz. Not everyone chooses to have a “Sign Night” for their 21st. 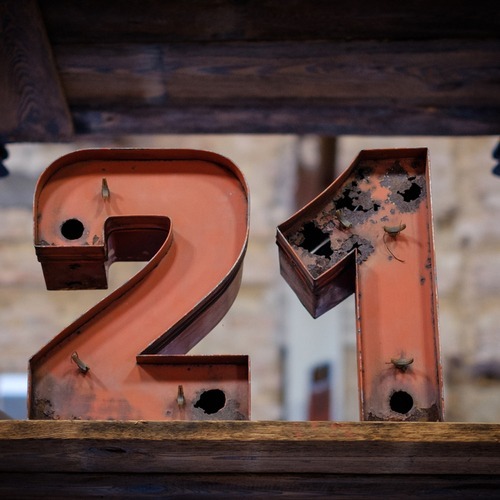 Here are the favorite places that those 21 and over recommend when going out to have 21+ fun. There are many clubs in downtown Orlando that accept 18 and over, but to drink you must be 21. Aero Rooftop Bar – open Thursday-Sunday for dancing, private cabanas & bottle serviceChillers – is actually in the central business district on W. Church Street. Check out the dollar drinks on Wednesday nights. Downtown on Thursday nights is always fun if you’re 21! Some other popular places are Shots (has dessert flavored shots and daily deals), Saddle Up, Crow and Attic. GILT – Often you go there after pre-gaming at Pub or Liv and then there is a bus to GILT, which is a club. M- Lounge is a rooftop bar near downtown and it is absolutely amazing! It is very classy yet reasonably priced. Some students take their families there graduation weekend for a happy hour. Wine Down Wednesday, located at Celine downtown, is also extremely popular. This takes place downtown and for $15 it is all you can drink wine and all you can eat. There is a mini food bar; nothing too extravagant. It is very popular and a great way to spend a Wednesday night. Taco Bell’s Cantina – opening soon and will sell beer, yes, beer. They will not, however, have a drive-through. Fraternity boys may sell bands for pre-banding for events to various bars. This can save money upon entry. Pre-banding can require a wait, but it is much shorter than just going and waiting to get into most places and may include entry as well as the bus. It can vary, so be sure to check. And, as always, be careful and call for a ride when you are ready to go home. Sorry, I had to say it; it comes with my parental rights.